Robot UPS allows you to display, and when necessary, override your system’s Quick Power Down Time (QPDT). If you feel your current QPDT is not sufficient to save your main storage, you can override (increase) the current QPDT, at your own risk, up to 999 minutes (16.65 hours). Before you override the Quick Power Down Time, you are responsible for testing to determine exactly how long it takes your system to perform a quick power down when it is running at full capacity. You also must ensure that your UPS hardware has sufficient battery protection time to completely back up your main storage based on the time it took your system to perform a quick power down during your test. Before you override the QPDT, keep in mind, you are responsible for any and all damage that occurs to your system and any and all lost information. In addition, increasing your QPDT increases the chances of your system receiving a weak battery signal, which can trigger the IBM to perform an auto-shutdown. Press F7 on the System Setup panel to display the Override/Display Quick Power Down Time Warning window. F7 is not a visible option on the panel. Read the warning, then press Enter to display the Override/Display QPD Time window. 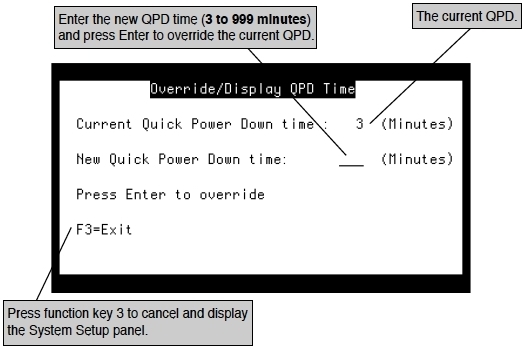 On the Override/Display QPD Time window, enter the new QPDT in the New Quick Power Down time field and press Enter. After pressing Enter, the value in the Current Quick Power Down time reflects the value you entered in the New Quick Power Down time field. In addition, a message displays at the bottom of the window indicating that the override was successful. Press F3 to cancel the override and display the System Setup panel.